Most of the trawler yachts originating from our design office follow the current trends. One only has to look through any issue of PassageMaker to see how similar, at least in style, the trawlers are from various design offices, including our own. Here, we suggest something quite different. The two versions shown are based on the original Spray design inspired by Joshua Slocum&apos;s sloop of the same name.These are well-proven hulls and there are more than 1,000 Spray-types currently cruising worldwide. While most of these Sprays are sailboats, this hull also has a proven track record when used as a powerboat. During the past 30 years,we&apos;ve discovered the Spray hull form exhibits excellent handling characteristics when operated as a powerboat. Especially suited to long-distance cruising, these hulls tend to climb over the seas as opposed to ploughing through waves. Being moderate to heavy displacement,the Spray hulls are great load carriers,as well as offering a comfortable motion in different wind and sea conditions.These hulls also respond well to all popular forms of stabilizers including active fins, passive bilge keels, or outrigger fish (flopperstoppers). Multi-chine steel versions are simple to build from a pre-cut hull, deck, and superstructure package.Assembly time is less than a third of the time it takes when building from construction plans and standard steel plate and profiles. (This time-saving factor applies to the building of any metal boat, and pre-cut steel or aluminum packages also save a considerable amount of the overall hull-building costs.) 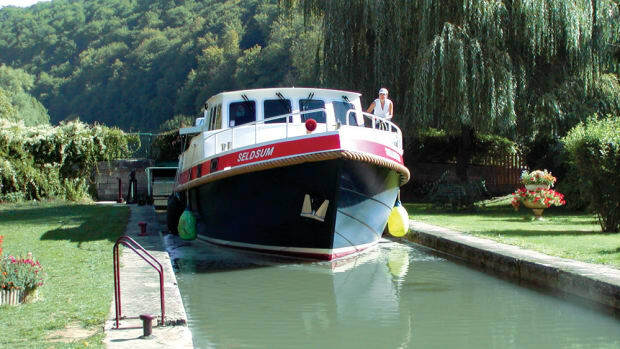 Round bilge steel versions are also available as partly finished or finished yachts. The steel used to build these vessels is Lloyd&apos;s-approved, A-grade shipbuilding steel. Since the specified steel is already shot-blasted and preprimed, the boat begins life never having known rust or corrosion. Steel boats built in this manner have a much better chance of staying corrosion-free than ones built from untreated steel. The first example of these Spray trawler yacht has recently been launched in the Pacific Northwest. This first boat, a Spray Trawler 58, was built for Stan Sargent, who will use her for long-line fishing in Alaska. Aley Iron Works of Whidbey Island, Washington, assembled this boat from a pre-cut steel package supplied by Bruce Roberts Steel Kits. To stand up to the rigors of commercial fishing in Alaskan waters, this particular boat was designed using 1/4-inch (6mm) hull plating. The first Spray 52 Trawler Yacht is being designed to U.S. Coast Guard "T boat" regulations for Edmond Badham, and will be used for charter. Another version is being designed for charter operations in the Caribbean. The large flush deck areas provide adequate stowage for a dinghy as well as various deck boxes. The moderate-sized bulwarks, combined with sturdy pipe life rails, provides that feeling of security so important when cruising offshore. The sheer interior volume of the design lends itself to numerous accommodation alternatives. Just two layouts are shown here, one for the Spray TY 52 and one for the larger Spray TY 58. Both feature full-standing headroom throughout the accommodation areas. The ondeck pilothouse could even be increased in size without compromising the stability of this vessel. The present A/B ratio is a very favorable 1.75. Another possibility in either vessel would be to have a "Grand Saloon" aft instead of a master stateroom. 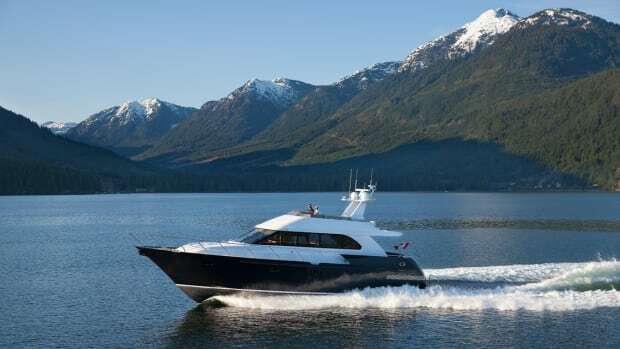 This layout option allows palatial seating across the wide transom, and often includes a wood-burning stove and even the galley on one side of the hull. Opening skylights can be added on deck to augment port lighting, although in warmer climates they likely will need to be covered up due to the strong sunlight. A full foredeck awning would work wonderfully on this boat, and provide comfortable living while cruising the tropics. The voluminous engine room is accessible from both forward and aft accommodation areas and features full-standing headroom throughout. There is adequate room to install a workbench as well as all of the machinery and equipment necessary in a long-distance passagemaker. 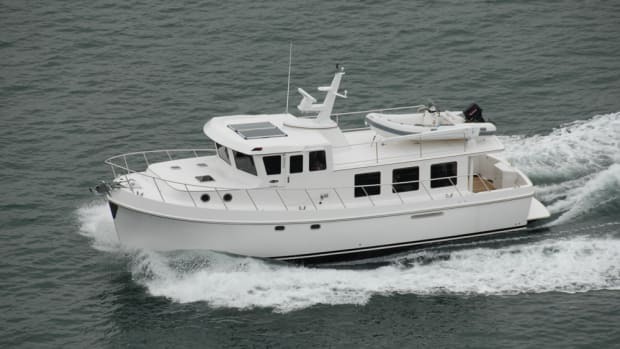 In either length, the Spray trawler yacht is a rugged, seaworthy, and comfortable cruising boat. I invite you to consider it when planning your next trawler-style motorboat.